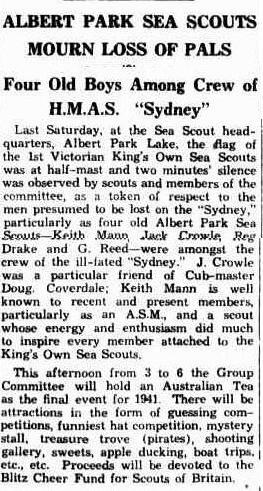 The 1st Victorian Sea Scout Group would like to pay our respects to all of our fallen friends and members including those of the 1st Albert Park Scout Group, that later merged to form what we know as the 1st Victorian Sea Scout Group. 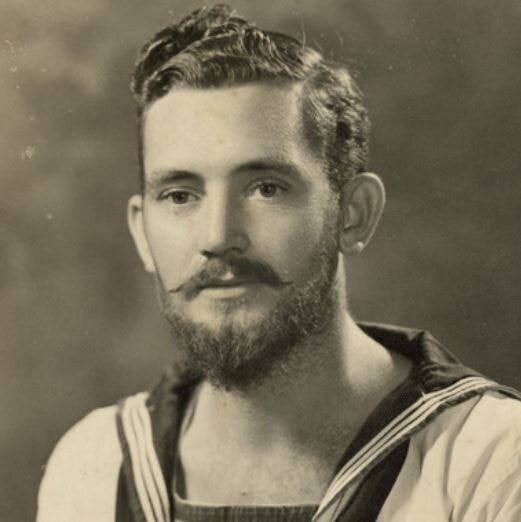 We would like to give our thanks to those that went on to serve in the Australian Defence force and pay our tribute to those that made the ultimate sacrifice. Place of rest: Lone Pine Memorial, Gallipoli, Turkey. CHILLINGSWORTH – In loving memory of L. W. 6th Battery, A.F.A. 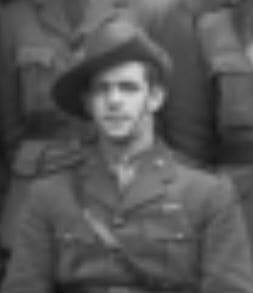 who made the supreme sacrifice at Cape Helle 11th July, 1915. EHRENBERG – A tribute to the memory of our former assistant scoutmaster Sergeant S. M. Ehrenberg killed at Gallipoli on the 7th of July 1915. 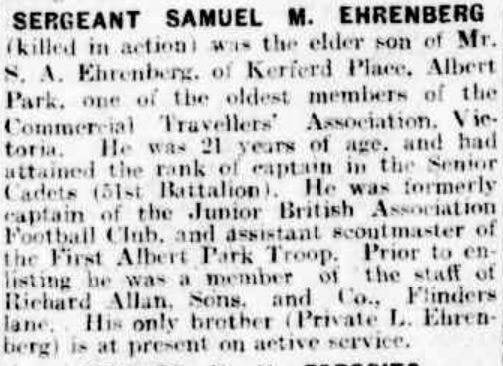 The death of Lieut M Erenhberg, of Middle Park, killed in action at the Dardanelles, has caused much regret in Scout circles. Lieut. 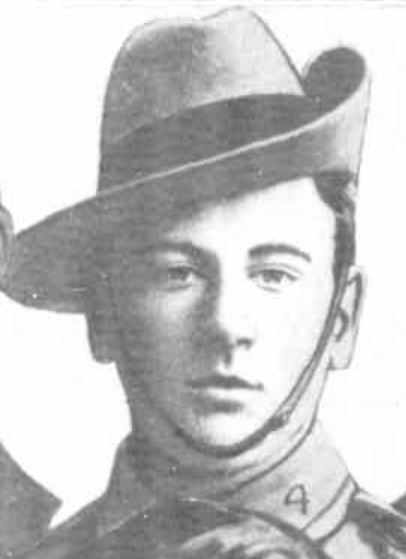 Erenhberg was formerly Assistant Scout Master to the Albert Park Scout Troop prior to his departure for the front. 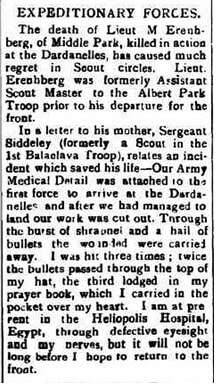 In a letter to his mother, Sergeant Siddeley (formerly a Scout in the 1st Balaclava Troup), relates an incident which saved his life – Our army Medical Detail was attached to the first force to arrive at the Dardanelles and after we had managed to land our work was cut out. Through the burst of shrapnel and hail of bullets the wounded were carried away. 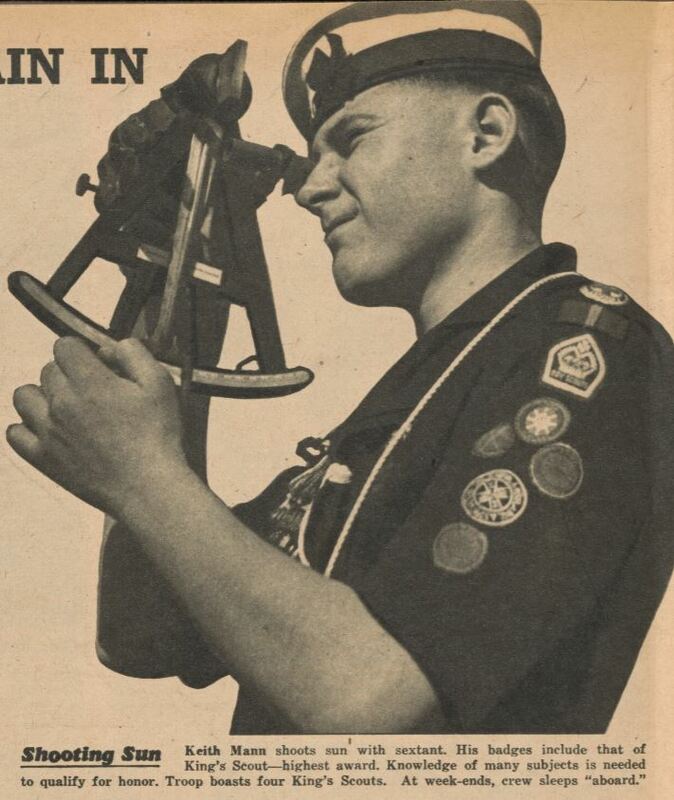 I was hit three times; twice the bullets passed through the top of my hat, the third lodged in my prayer book, which I had carried in the pocket over my heart. I am at present in the Heliopolis Hospital, Egypt, through defective eyesight and my nerves, but it will not be long before I hope to return to the front.